During the UFC 189 World Tour in the spring of last year, Conor McGregor had a featherweight title fight against champion Jose Aldo lined up, but publicly stated his ambitions to go after the lightweight belt for the first time. He characterized the 155-pound weight class as a “stuck-in-the-mud division,” and directly addressed lightweight titleholder Rafael dos Anjos. “I’m coming to get you, too,” McGregor told the Brazilian champion. 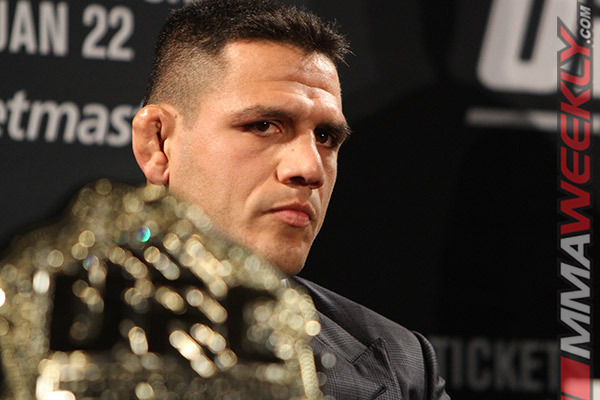 Dos Anjos suggested that the Irishman stay in the 145-pound division. “Tell him to stay at featherweight because here (at lightweight) it is going to be tough for him,” advised dos Anjos. McGregor knocked Aldo out in 13 seconds to capture the featherweight title at UFC 194 on Dec. 12. Dos Anjos defended his title a week later by finishing top contender Donald Cerrone in 66 seconds. McGregor faces dos Anjos in the UFC 197 main event on March 5. McGregor could make history by becoming the only fighter in the UFC to hold two divisional titles at the same time. “The Notorious” has predicted that he’ll conquer dos Anjos within a minute. The champion has a different plan heading into the fight, and part of it is making McGregor pay for his trash talk. He believes an opportunity to put McGregor away will present itself early in the fight, but he doesn’t plan to exploit it. Dos Anjos wants to carry McGregor into the later round to “punish” him.